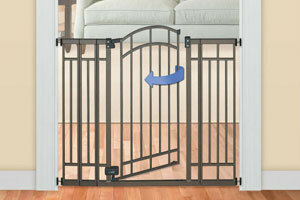 Some parents and child care specialists prefer classic wooden baby gates over their newer metal or fabric counterparts. Whether that preference is due to practical reasons, safety reasons, or just plain aesthetic reasons, there are quite a few options available when it comes to wooden baby gates so it can be a bit difficult to choose. We’ve tried to distill those options down to the best ones, listed below with their different features in a sortable table. 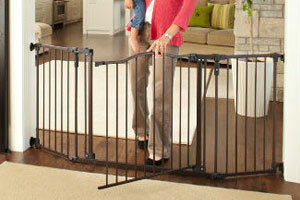 North States’ popular Superyard baby gate is available in this rich brown wood variety. The key benefits of the Superyard is its remarkable width and versatility, able to be used as a portable playpen, barrier for fireplaces, or simply an extra wide gate. 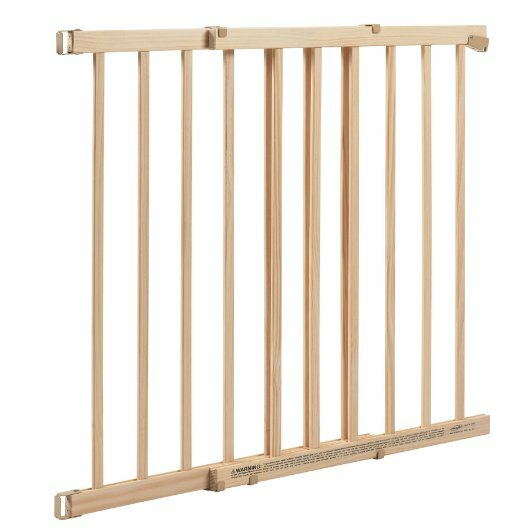 As far as practical reasons go for buying a wooden baby gate, wood is of course easier for most people to modify and build with than metal. Wood gates without finish can also be easily stained to match your existing trim or molding. 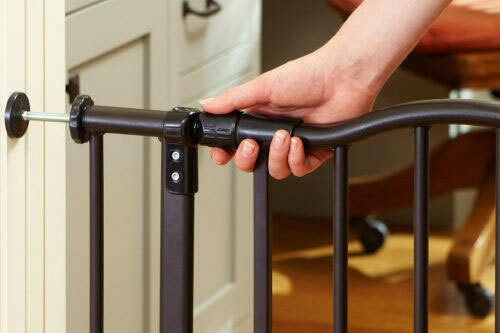 And wood is also cheaper than fabric when used for expandable or retractable baby gates. As far as safety reasons go, if knocked down by the child a wooden gate will typically be significantly lighter than a metal gate, and can also be more forgiving than metal if knocked into. However, thinner wooden pieces can also splinter if snapped, which can pose its own safety problem. Aesthetically, some people prefer a classic wood look over a more modern metal or fabric look, and a wooden baby gate may match your home or desired enclosed space better than those other models. With that said, let’s take a look at some of the standout wooden baby gates available today, so you can hopefully find the right one for your home. Hopefully the comparison chart above is helpful in getting a sense of which wooden baby gates may be best for your home. Now we’ll examine a few of the highest rated gates from the table above in more detail. 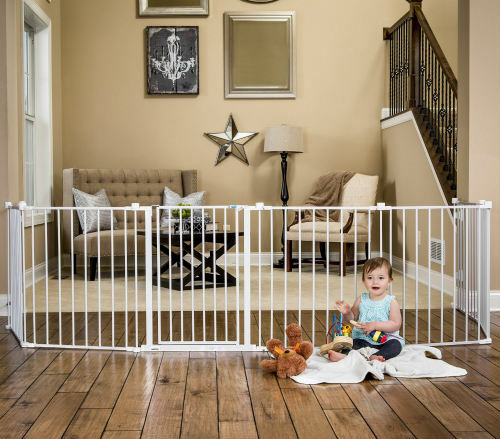 The North States Superyard, which has its metal version featured in our Extra Wide Baby Gates page, is a popular choice due to its sheer versatility. It comes with 6 wooden panels, so it can be arranged in a number of different configurations stretching up to 144 inches. 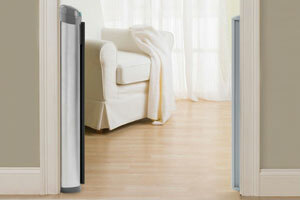 It is so wide that you can use it to entirely barricade a dangerous portion of your home, such as a fireplace. Or if you have an open concept room you can stretch it entirely wall to wall to make one side of the room an enclosed play room for the baby. 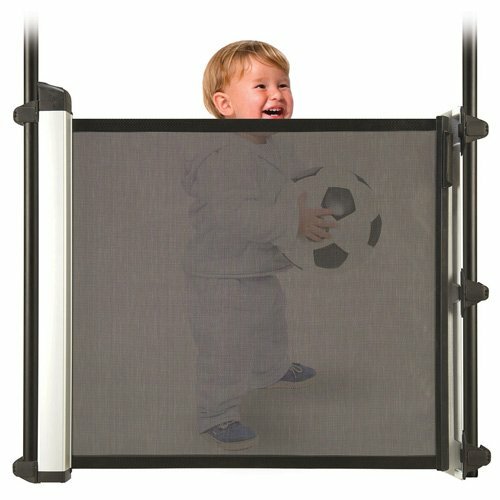 Or you can attach the gate to itself in a circle to make a 10 square foot playpen. And naturally, if even more space is desired you can purchase multiple Superyards and connect them to each other, or purchase these 2-panel extensions that are sold separately. Adding a 2-panel extension turns the 10 square foot playpen into 19 square feet of play space. 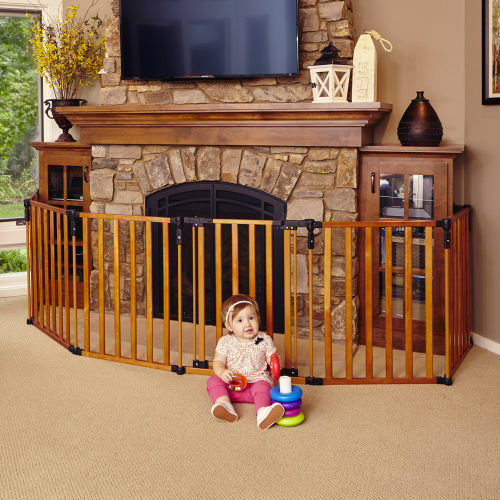 The wood finish of the Superyard is a dark brown, and the wood is nice and smooth, making it an overall quality product from a quality brand in the baby gate space. 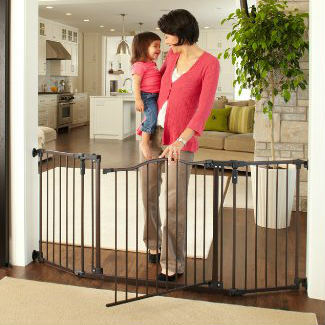 North States also makes an expandable accordion-style baby gate it calls the Supergate Expandable Swing Gate. The Supergate hardware mounts, and the interweaving wood pieces allow it to expand out to fill any spaces very flexibly between 24 and 60 inches wide. 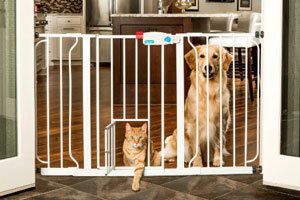 When you’re not using it, the gate can be contracted mostly out of the way, similar to a retractable baby gate. It also has a one-handed-operable safety latch that allows you to open and close the gate in a swinging motion, like you get from a gate on a fence. The accordion style expansion is an aesthetically pleasing pattern, and while the wood pieces in the Supergate are thinner than in other models of wooden baby gates, they are reportedly sturdy enough for most cases. It is of course advisable with a thinner-pieced gate like this to use precaution and not place it in an area where it might get splintered (i.e. using it to coral a large dog). 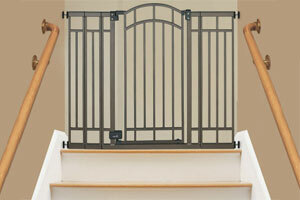 Not all gates are safe to use at the top of stairs. 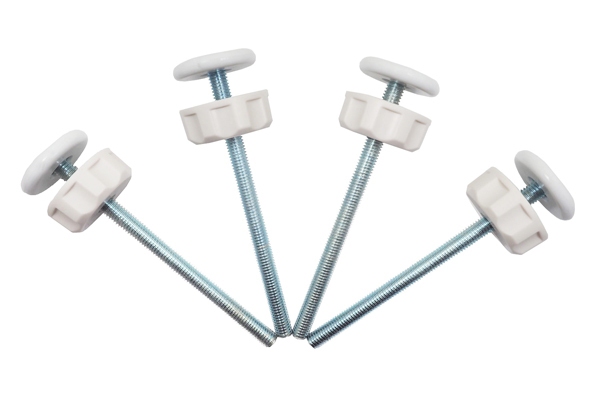 It takes hardware mounting (no pressure gates) and for wooden baby gates a strong enough wood to withstand a lot of pressure. 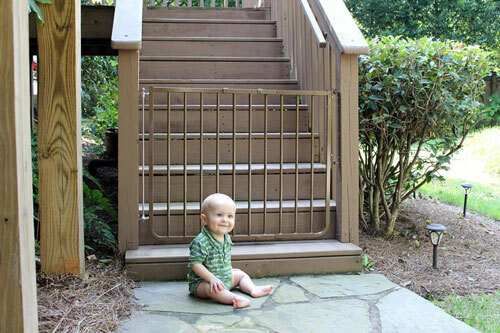 This Evenflo Top Of Stair Plus Gate meets those requirements, and have received generally favorable reviews with a few bad experiences mixed in. 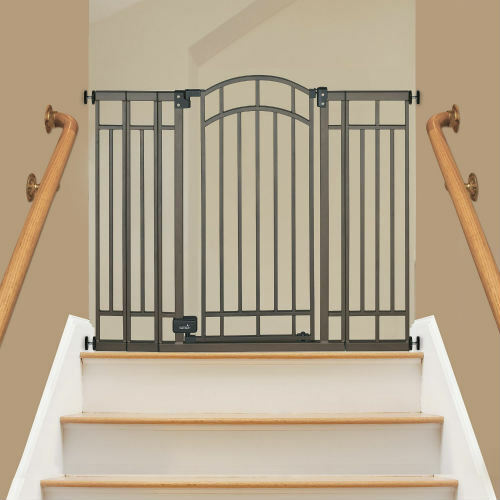 This Evenflo gate swings open in either direction, but when placed on the top of stairs has a feature that limits it to swinging open in one direction, so it never opens over the stairs. 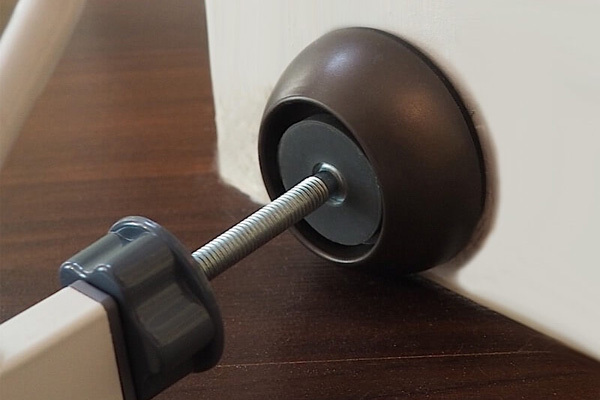 If installing against banisters, you may want to consider getting a banister saver like the EZ-Fit, which provides a wooden surface to screw your gate hardware into to protect your banister wood. The gate is an unfinished smooth wood, so is stainable. Paint should probably be avoided, because its thickness can prevent the gate from sliding open, but there have been customer reports on this gate of successful staining.